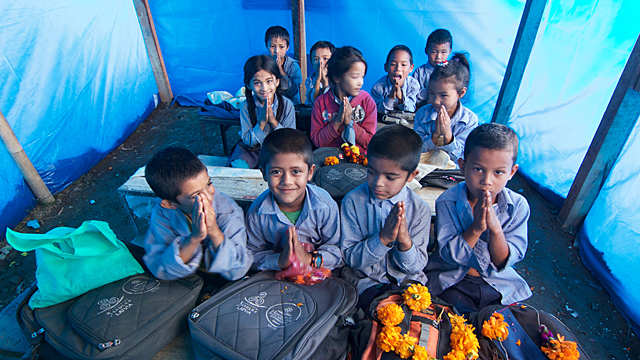 THE GAYATRI FUND (NEPAL: COMPASSION IN ACTION) has been operating since April 2015. 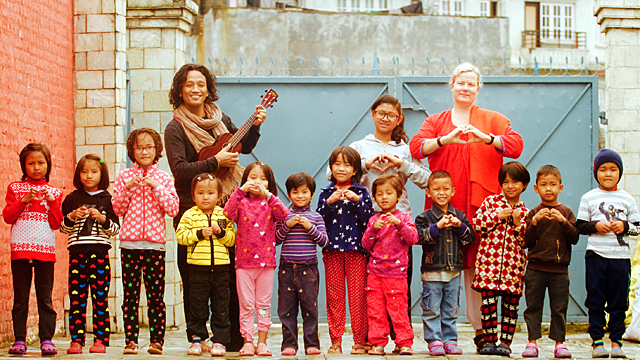 Throughout this time, it has been a continuous outpouring of love and daily proof that compassion born in one’s heart can and does create a ripple that has no borders, no limitation of time and space, and can indeed change the world of individuals and communities and even plant the seeds for the development of a country, one child at a time. 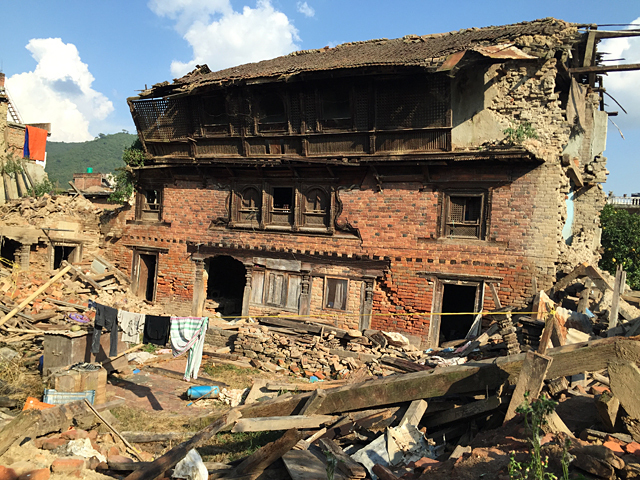 The Gayatri Fund was officially founded after Nepal’s devasting earthquake in April 2015. Deva, Miten and Manose (who was born and raised in Nepal) were seeing the pictures, hearing the news directly from Manose’s relatives in Kathmandu and feeling the urge to help. The severity of the situation sprang them straight into action. They contacted Eva Tedert, who had been working with the street children of Nepal for many years (The Society of Street Children of Nepal), and also Kurt Amert, who had experience working in a NGO (Kriegskindernothilfe) with projects in Romania, Syria, Albania, in Kosovo and Pakistan. 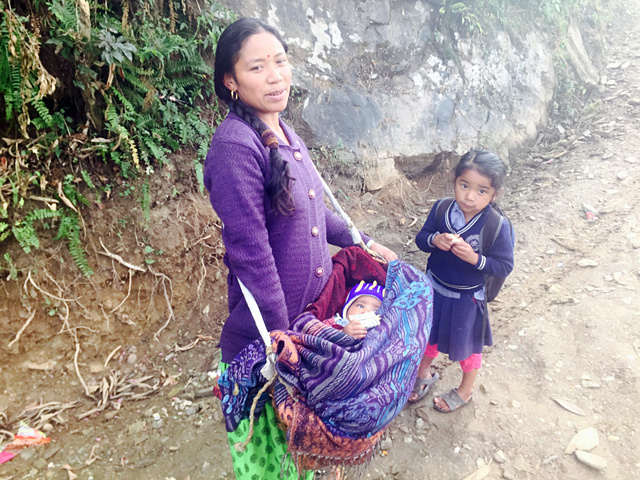 During the first weeks after the earthquakes, we could go on giving medicines and some equipment to health posts in villages in the region of Sindhupalchowk. After the most vital needs of the earthquake victims were met, efforts have turned to rebuilding basic infrastructure in the villages and providing support and education for the children, many of them orphans. Before the devastating earthquakes Rathankot, a remote Himalayan village had around 200 households, farmland terraces on the hillsides, water in the river below the village, a school for more than 100 students from grade 1 to 8. It was not a rich village but people survived thanks to their abundant natural resources and fertile soil. In April 2015 everything changed. The village was destroyed by the earthquakes. The school walls still stood but entering the building was too dangerous. 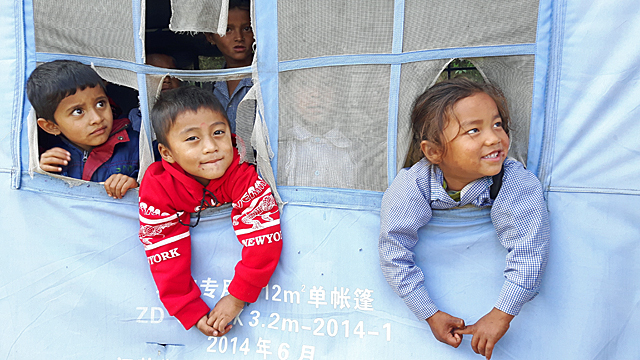 One of the first emergency actions, spring 2015, was to provide the children of Rathankot with school tents so they could go back to their education as soon as possible, although, unfortunately, with only three teachers for all eight grades. The temporary school was the best that could be done at the time, but it was far from ideal for long-term education (imagine the noise in monsoon times, for example). The Gayatri Fund rebuilt the school and secured the ground in 2016 and 2017. The most interesting thing is how this rebuilding was carried out. 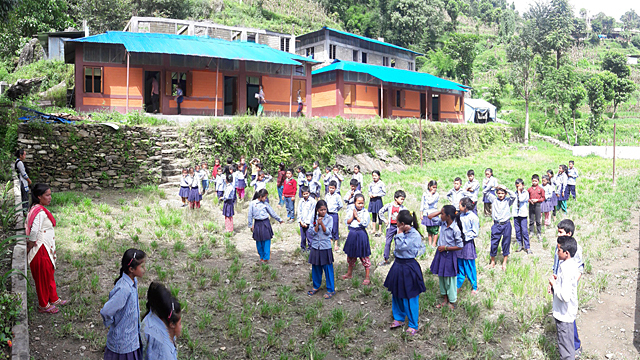 Easiest and cheapest for us would have been to hire a company from Kathmandu just to rebuild the school. However, we wanted to provide long-lasting help for the village and give the people not only a school but also skills. We bought a brick press and tools; and twenty villagers, ten men and ten women, were trained in how to make earth bricks out of 90% soil and 10% cement, using their natural, local resources. After that the training company came back and held training in construction work. The villagers built their own school, and they developed not only skills but a sense of ownership, pride and confidence in their ability to provide for their own children. Rathankot village has now a school for 130 students. The villagers also have started to construct a new community hall at their own cost thanks to the skills and the tools we gave them. They are also able to earn money as they can offer their skills to other villages. The ancient town Sankhu, just north of the world heritage city of Bhaktapur, was badly hit by the quakes, mainly after the second one, which occurred on the 12th of May. The Gayatri Fund built a new water well, finished 2017. The construction was done following traditional Newari building techniques, materials and style. In Nepal, wells do not only provide clean water, but are also spaces traditionally used for ceremonial and social purposes. 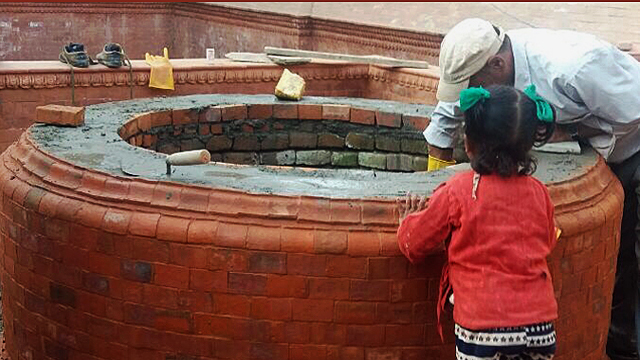 The well that The Gayatri Fund rebuilt in Sankhu is becoming an important space where culture and tradition is celebrated. Maghi Gaun literally means ‘Fishermen village’. It is a little village surrounded by a lush landscape and a powerful river that makes the area very fertile. The only problem with the river is that is located 147 meters below the village. In order to bring water to households, livestock and crops, children had to walk down to the river and climb all the way back up to the village, which prevented them from attending school regularly or altogether. Thanks to The Gayatri Fund (2016) the village now has 650 meter water pipes, a pump and seven taps. The children are at school now instead of carrying water. Later, the Society for Street Children in Nepal (2017) donated 28 goats to help the women in the village earn a living. Helping villages to become self-sufficient is one of the priorities of The Gayatri Fund. 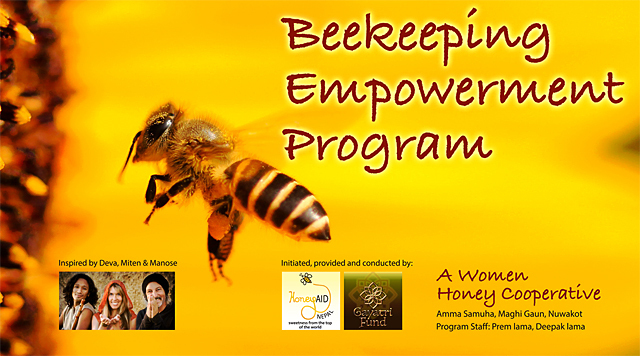 In order to continue working in that direction, the next project 2018 is a beekeeping project in Maghi Gaun. With finance from The Gayatri Fund the villagers of Maghi Gaun will get training in beekeeping and also equipment needed to produce honey. The project has started this winter and will get consolidated in 2018. When it comes to long term impact, funding and supporting medical college students in Nepal is at the very heart of The Gayatri Fund. Currently the fund is financing the studies for three of fifteen girls who are being sponsored at Medical College in Kathmandu. 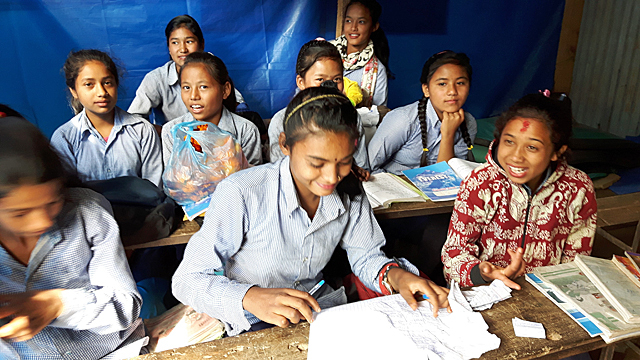 All girls come from very remote villages, with no access by conventional roads, where there is no medical care at all and they are chosen for their excellent academic records, determined attitude and deep commitment to help others. After their training, they will return to their villages to work for their communities for a minimum of five years. It is beautiful to see how finance for this project comes from all over the world: Germany, Netherlands, Sweden, the UK and the USA, including individuals, companies and other organisations such as the Swedish Society for Street Children in Nepal and the German Kriegskindernothilfe. 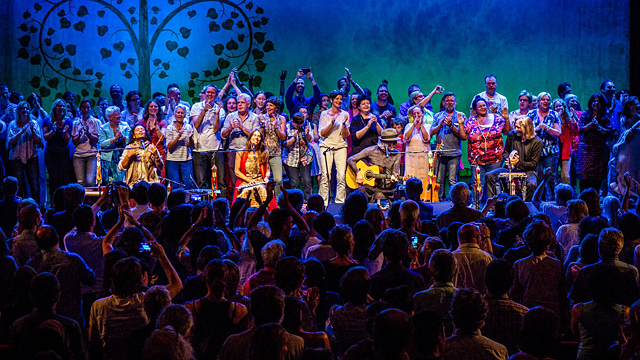 And when a group of people get together from a heart space, the result cannot be anything other than compassion and oneness. 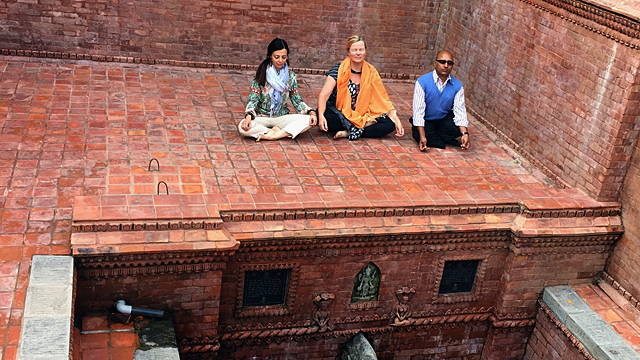 The Gayatri Fund has given the opportunity to put this sangha’s compassion into action and help implement these seemingly small projects in Nepal that contain the seed of long term, deep and continuous impact on the lives of so many children and communities for present and future generations. Let the love keep growing. Thank you for your heartfelt support. The Gayatri Fund is a registered association in Germany. We can issue donation certificates because of our humanitarian activities. For more information: Gayatri-Fund@web.de.